Read about some of the major real estate players in San Diego, current market trends and updated market reports. Ask farmers market veteran Catt White whether her vision for the San Diego Public Market is a concept of the past, and she’ll say rather confidently that it’s not. Voit Real Estate Services’ San Diego office is pleased to announce the completion of a 106,584-square-foot lease transaction located in San Diego. The 15-year lease with Ballast Point Brewing & Spirits had an estimate value of $16 million and represents the largest industrial lease in San Diego this year. This transaction is a prime example of Voit Real Estate Services’ focus on delivering superior service to our clients, as well as exceptional internal collaboration to deliver creative, win-win solutions. SR Commercial, a privately held, full-service commercial real estate investment company headquartered in San Diego, is actively pursuing new investments throughout Southern California. The firm, led by principals CJ Stos and Adam Robinson, has acquired more than 611,633 square feet of quality industrial and office properties in 2013, bringing its total portfolio to 720,966 square feet. Now, and in the future, offices will be more mobile, characterized by high information flow from the top down, and be less managerially centralized. Office real estate will look different (55 percent of office space is estimated to be underutilized), open on the inside and flexible on the outside. The trend will be accelerated by mobile technology, economic volatility, and a global war for the talent. We’re quickly approaching the “death” of the office as we knew it. New tools are helping designers understand how work settings contribute to effectiveness, interaction and collaboration, and job satisfaction. Taking time to reflect on the progression of technology allows for the appreciation of the way it has transformed the modern-day workplace. Gone are the days of the crank-dial telephone, the typewriter and the bulky desktop computer. Instead, we turn to our smart devices, our smartphone, our tablet, and now our smartwatch, to inform us when, where and how we must accomplish our tasks. The evolution of smart products allows for improved efficiencies and an all-around better way of doing business. While some may argue that Freddie and Fannie have single-handedly saved the multi-housing sector from disaster during the Great Recession, others counter that they are single-handedly responsible for artificially low yields. However, no one can argue with the fact that over the past several years the agencies have provided much needed liquidity to the multihousing industry. From 2009-12, Freddie and Fannie have collectively financed in excess of $235 billion of apartment loans, the lion’s share of multihousing loan production. But this is changing. CIRE Partners is a full-service investment firm based in La Jolla, comprised of highly skilled professionals assisting clients nationwide. The company's mission is to provide clients with the highest level of professional advisory services to accurately meet their real estate investment goals. They are focused on building long-term client relationships through honest evaluation and innovative strategies to create and preserve wealth for clients’ Commercial Investment Real Estate portfolios. With its recent acquisition of the assets of Circle Foods, Tyson Foods Inc. (NYSE: TSN) has joined an impressive group of Fortune 500 companies at Siempre Viva Business Park, assuming the title of largest employer on Otay Mesa, with just over 1,000 employees. As we turn the page to a new year, so does the hospitality industry -- there are quite a few businesses going through closures, remodels and buyouts, in and around downtown San Diego. Facilities management is as much about navigating employer-driven change, personal goal achievement, and market opportunity as building technical, managerial, and leadership prowess. The Building Owners and Managers Association International has released its newest publication, Developing, Leasing and Managing Healthcare Facilities in an Evolving Healthcare Environment. According to new analysis by Kingsley Associates, buildings that have earned the BOMA 360 Performance Program designation have higher tenant satisfaction scores in all rating areas as compared to commercial office buildings without the BOMA 360 designation. Most notably, 94 percent of tenants in BOMA 360 buildings report high overall satisfaction. According to a study of data from the Building Owners and Managers Association International’s Experience Exchange Report by Kingsley Associates, the commercial real estate industry’s ongoing focus on energy efficiency has resulted in a downward trend in total operating expenses. Home prices dipped slightly in November from October, but were 15 percent higher than in November 2012, according to the Greater San Diego Association of Realtors (SDAR). Tiny houses measuring in at less than 500 square feet are popping up across the country -- but it’s unclear whether such units would succeed in San Diego. Movers say the new California Air Resources Board (CARB) regulations effective this Jan. 1 are not only expensive, but also driving them out of state. A unit of Phoenix-based Alliance Residential Co. has acquired the 549-unit Coronado Bay Club Resort Apartments in Coronado for more than $160 million. In a move that will please local shipyards and dock workers' unions, a San Diego judge has given a green light to a referendum to overturn the City Council's rezoning plans for Barrio Logan. Construction began Monday on a parking structure for county employees two blocks west of the County Administration Center in Little Italy. The 283,786-square-foot Bank of America building at 450 B St. has been sold for $73 million -- well outperforming the $60.15 million the asset garnered late in the fall of 2011. Enterprise zone tax credits for businesses in designated blighted areas will end Dec. 31. Three replacement incentives will take effect Jan. 1. CBRE will embark on a transformation of its 6,500-square-foot downtown office space in DiamondView Tower, and many commercial brokerage firms are considering or have done the same. Despite several San Diego County-based biotech firms vacating hundreds of thousands of square feet through acquisition and merger the past two years, the availablity of large spaces still remains limited, according to a report. San Diego-based Synergy Real Estate Group is an international alliance of tenant-rep brokers who specialize in rapid turnaround for their clients. "Strong," "agile" and "competitive" are words that can be used to describe not only Westcore Properties, but also the two leaders of the San Diego-based international real estate acquisitions firm. In the commercial real estate market, being opportunistic and disciplined is key to growth. Now combine those qualities with smarts, patience and persistence and you have the formula for Kilroy Realty Corporation's 60-year path of success on the West Coast. The first time Joe Greenblatt took a class from the Institute of Real Estate Management (IREM), he had to travel pretty far. The class was in San Diego and Greenblatt lived in his native St. Louis. More than 20 years later, he's gone pretty far again. Home buyers, sellers and real estate agents, take notice: Cameron Herndon does not come to the negotiating table unprepared. The vice president and CFO of Poway-based Herndon & Herndon is a self-admitted research fanatic. Local real estate professionals took a look back on 2013 while predicting what’s to come in 2014 at a recent roundtable discussion hosted by The Daily Transcript. The biggest change for buyers and sellers in 2014 will be the absence of investors come spring, they said. The coming year for commercial real estate in San Diego holds promise and perils. Read about some of the major real estate players in San Diego, current market trends and this year's TOBY Award- winning properties. Read about some of the major real estate players in San Diego as we profile individual leaders in commercial and residential markets. Read about current real estate market trends, market reports, financing options and more. Read about the major real estate players in San Diego, investment and financing options, current market trends, market reports and more in this special section. This special report highlights the major real estate players in San Diego, along with individual leaders in commercial and residential markets and the office leasing marketplace. 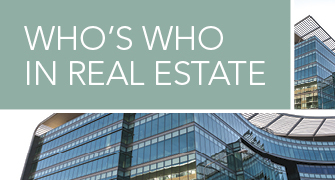 Find out who the major real estate players are in San Diego, as we profile individual leaders in the commercial and residential real estate markets, as well as those in the office leasing marketplace and private sector companies. Find out who the major real estate players are in San Diego as The Daily Transcript profiles leaders in commercial and residential markets, as well as those in the office leasing marketplace.